The National Foundation for Celiac Awareness's signature event, Appetite for Awareness: A Gluten-Free Cooking Spree, will be held on Sunday, October 24, 2010. This year, the gala is moving from the former Wachovia Center to the 40,000-square-foot Cruise Terminal at Pier 1, at the Naval Business Center in South Philadelphia, and will run from 2 p.m. to 6 p.m.
New for the seventh annual event [click here for a recap of last year's shindig] will be a Children’s Pavilion, where kids can get hands-on with their favorite gluten-free foods. In addition to the popular Cooking Spree (where area doctors pair up with some of the city's best chefs for a kitchen competition), the area's largest gluten-free vendor marketplace will return. Participating companies will have free samples, coupons and opportunities to purchase hard-to-get items. Plans for a Beer Garden are in the works as well. Early Bird tickets are available now through October 23. The discounted prices are $50 per adult, $25 per student (12+ with ID), $20 per child (up to 12 years old) and $125 for a family of four. Last-minute attendees can buy tickets at the door for $75 per adult, $35 per student, $25 per child and $150 per family. Event sponsorships are available, as are opportunities for area restaurants and local and national vendors to participate in the event. The NFCA is also accepting Program Book ad submissions. The keepsake Program Book will be given to all attendees and includes information on participating restaurants and vendors, chef biographies and other resources. 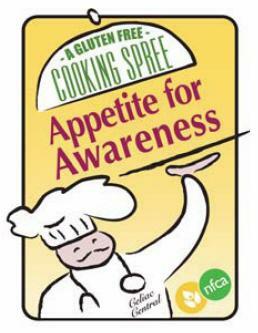 For more information, call the Appetite for Awareness Hotline at 215-325-1306 extension 400. This sounds like a wonderful event. Might be worth a trip down from NYC! Thanks for posting.